April 25 is Anzac Day. 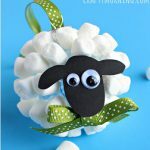 Help the kids learn more about the culture and history of our Australian neighbors while making this Wooly Sheep craft. Trivia: Australia is the leading producer of wool which is mostly from Merino sheep. Merinos have the finest and softest wool of any sheep. An adult sheep has their woolen fleece cut off, or shorn once a year. A typical shearing facility can sheer 3000 sheep in a day. Click on Printables for a pattern. 1. Cut 5 1/2” x 4” foam board. Round corners. Punch two hanging holes through foam board using a toothpick. Cut a 24” length vinyl lacing. Thread each end through foam board holes. Tie ends together in a knot. 2. Cut Styrofoam egg in half. Cut black felt using head pattern. Apply a generous amount of glue on one side of felt. Stick felt on Styrofoam head front. Rub your palm around the egg and felt sides to shape and stick the felt to the Styrofoam. 3. Cut two black ears from felt. Apply glue to ear top. Fold ear in half. Hold ear top together with a paper clip until glue dries. Cut two black legs from felt. Glue felt legs on ends of two mini craft sticks. 4. Cut a 3/8” x 9” ivory felt strip. Cut length in half. Apply glue along one 4 ½” length. Roll the felt strip into a coil. 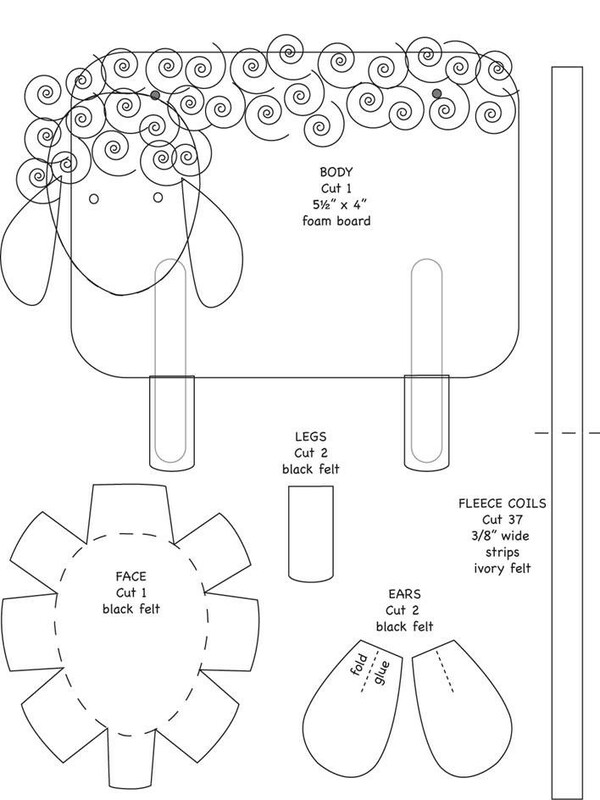 You will need about 73 coils to make sheep. Note: The irregularity of hand-cut felt coils adds interest and character to the finished piece. 5. Dip in glue and insert craft stick legs in the bottom of foam board. Trim excess felt from head back making it even with the flat side of Styrofoam. Glue head on foam board. Glue ears on each side of head. Glue felt coils on foam board around head. Glue felt coils on sheep’s forehead. Glue wiggle eyes on face. Let dry. What a cute craft! Thank you! I’m going to adapt it somewhat and use it in ‘Tween Girls and God digital magazine. This is a non-profit ministry for girls ages 9-12. I will link the girls back to this site as the site where I found the craft and give you full credit as originator. Thanks again! Thank you so much for your courtesy.